The plan was for us to write our vows to each other, but we found vows that we felt were perfect for us and used those instead. In regards to reciting our vows to each other, we were both so nervous we held little booklets with our vows typed and posted inside though the original plan was to have them memorized. We knew we would stand up there and our minds would go blank. The little booklets are a wonderful little keepsake as well. Worked perfectly for us. 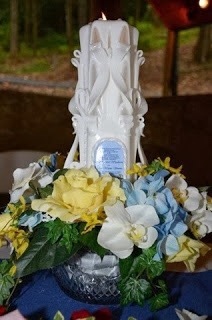 Not as much of a DIY project on my part, but still completely handmade pieces, were our unity candle and candles for decor around the entire wedding site. These came from a special candle store that has the most gorgeous hand carved candles! They handmade and personalized every single piece to display our invitation, match our wedding colors, and compliment our theme. They were just stunning additions to our special day! The store is called The Candle Carvers and they are a family ran business in Tennessee. They make the most gorgeous pieces and are very worth visiting!! Pictures to follow. 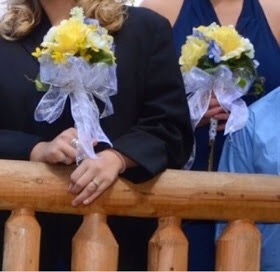 A close friend of our family, my mom, my sisters, and a few close girlfriends of mine all handmade every single one of our bouquets and floral arrangements for the wedding decor, bridesmaids bouquets, and my bouquet. This was definitely budget friendly, but more importantly it was so special because we created a lot of memories making those pieces together and we all were able to keep those memories forever as well! 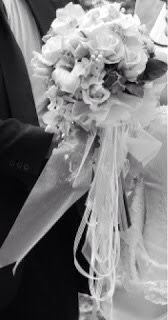 Below is a black and white of my bouquet. I will get a closer, clearer photo and upload later. 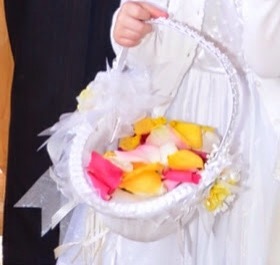 Below was my little, sweet sisters flower girl basket. We found an all white pretty yet basic basket and finished it off with little buds of the flowers we used in the larger bouquets. Also for rose petals to throw while going down the isle we just went to Kroger and asked for their extra petals. If you choose a specific color it’s more, but if you take all colors (That it what we chose and I preferred it. Beautiful!) then it’s much cheaper. Was less than $7 for a bucket full of petals to cover all tables, flower girl to use, and add pretty flower petal touches around where ever needed. We had plenty. Where to go for the flowers? Hobby Lobby definitely! We went to a combination of retail stores and suppliers to look and grab little things, but the place we found the bulk of our floral supplies was Hobby Lobby. 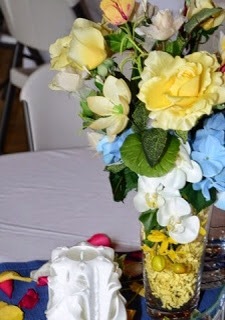 The floral options are awesome, the flowers look real, and their prices were wonderful! You couldn’t tell for a second at any distance these pieces were not real. 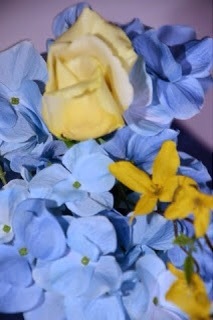 The colors in our wedding were soft yellow and blue primarily. 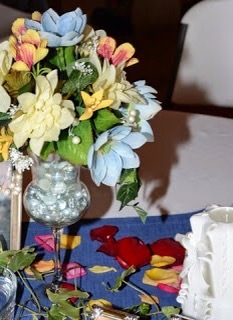 Our flowers were focused on roses and hydrangea with other small detail flowers and greenery that we thought mingled well with each piece. It all comes down to personal preference when picking these types of things and the tiny filler details become a thing we really chose as we shopped. We used some ivy and small detail pearls as well. 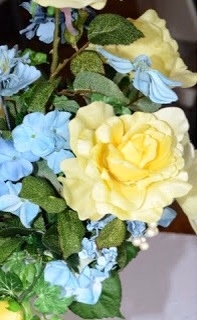 All of the bouquet stems were wrapped in a braided detail with ribbon allowing the bottom of the green stems to still show through. 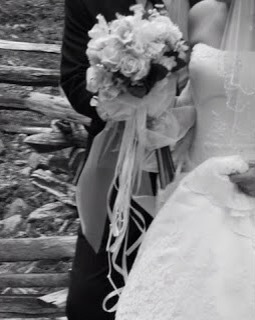 All of my flower girls had a ribbon style, my MOH (Maid of Honor :D) another style, and then mine was different ribbon in addition to more little ribbons with knots made in them to symbolize love knots. They were perfect! We found 4′ shepherds hooks at an excellent price at a local tool shop and purchased a couple dozen of those. (If I recall correctly they were just a few dollars a piece.) These were all placed to line the inside of the isle we would walk down on either side with decorative ribbon running down them and mason jars hanging from them with little bits of ivy and fresh flowers to match our colors. 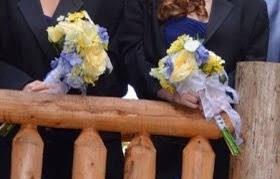 We used daisies (the flowers in my parents wedding so that was a special link). 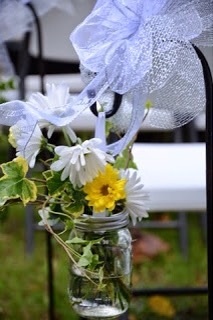 The jars were hung simply by attaching ribbons (wrap the ribbon around the metal rim top for secure attachment) with hot glue to the jar’s metal lid rims only and then we screwed those down onto the mason jar tightly. 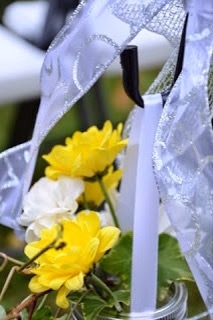 This secured the ribbon as the hanger and left the opening for the flowers to set. So just remembering to pull your center lid insert out of your canning jars and just use the lid rim to create basically small hanging vases for little floral arrangements to line your wedding isle. They were lovely details on either side of the isle. Just beautiful. Previous Post Improving your Credit Score !